City of Aragon. In the Middle Ages it possessed a prominent Jewish community, which enjoyed several privileges, and which paid in the fourteenth century a yearly tax of 300 sueldos. Its members were engaged in commerce and industry, especially in wool-weaving. During the persecutions of 1391 many of them were killed, while others accepted Christianity in order to save their lives. The Jews of Teruel had a statute according to which a document was legal only if it had been drawn up by the communal secretary and bore his seal. Failure to comply with these regulations entailed a fine of 20 gold gulden (Isaac b. Sheshet, Responsa, No. 304). About 1385 a delator ("malsin") appeared at Teruel; and the community asked Isaac b. Sheshet how, under existing circumstances, he should be dealt with. Among the many wool-dealers of the city were Don Solomon ibn Yaḥya and Don Judah ibn Yaḥya. 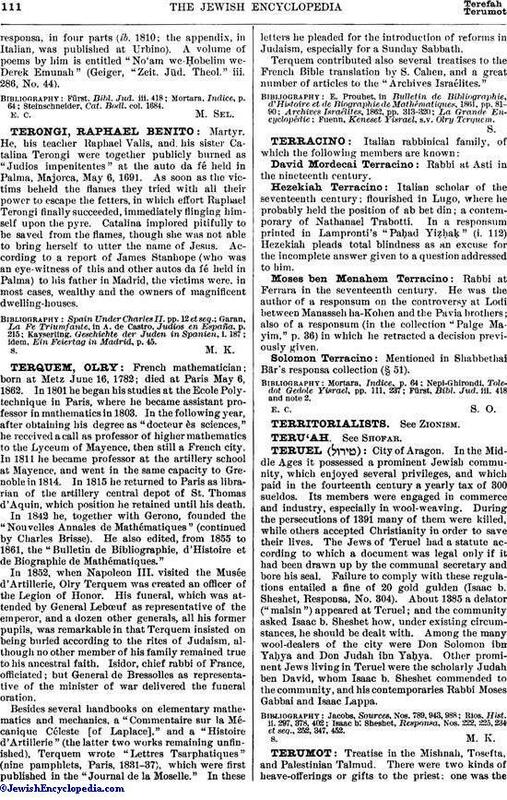 Other prominent Jews living in Teruel were the scholarly Judah ben David, whom Isaac b. Sheshet commended to the community, and his contemporaries Rabbi Moses Gabbai and Isaac Lappa. Isaac b. Sheshet, Responsa, Nos. 222, 225, 234 et seq., 252, 347, 452.